With 12+ years experience, Will has an incredible talent & passion for home improvement! He loves the varied work, creating his own schedule & building relationships with his members. He loves kitchen & bathroom remodels. Wood trim & cedar & vinyl siding are his specialties. He is also skilled in installing & replacing windows. He has incredible talent & was born to be a handyman. Becoming a professional Handyman has given me the opportunity to become more organized and focused in providing my members with professional quality services. I've always enjoyed fixing things, building, helping friends and neighbors with their projects, etc. Now as a handyman I get to do that every day! 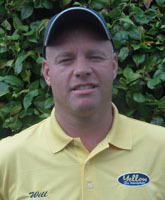 Before becoming a Franchise Owner for Yellow Van Handyman I specialized in owning and managing Rental properties, remodeling and fire restoration. I look forward to assisting my members (customers) with improvements in their homes. I strive to give my members peace of mind by using a trusted professional handyman that will take care of their needs. I work hard to get to know the people that I am working for and ensure that their needs are met. While I am able to complete just about any task that needs to be done I do have my specialty. I specialize in remodeling bathrooms and kitchens no matter the size. repair I am asked to do is fixing light fixtures, toilet and drywall repair. The most unusual request that I have received was to put a sliding glass door in a bedroom. It is very flattering when a member refers my services to a friend. It tells me that they have liked the work that I have done in their home or business and that they have trust in me. I feel a great responsibility to provide everyone that I serve with quality service. Will Carrel did a fantastic job. Our patio screen door looks great. Difficult job was completed timely and complete. Will did an outstanding job. He is our "Go To Guy" for home repairs. Extremely happy with Will and his team. Friendly and professional - did great work as well! Would highly recommend them for any job you have!